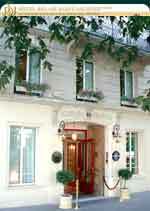 The Relais Saint-Jacques is situated near the heart of the Latin Quarter and a few steps away from the Luxembourg gardens as well as the Pantheon and the Royal Chapel of Val de Grâce. Come and discover the 21 original rooms and the Suite, individually decorated with stylish furniture and old paintings. Luxurious bathrooms, bathrobe, hair dryer, trouser press, radio alarm, mini bar, wall safe. Ideal for small meetings(6 Pers) or family’s stay (3 pax) Suite with 1 double room and 1 lounge which can be adjusted as room (double bed) or conference room. The hotel does not have a restaurant, but hot or cold dishes may be served for lunch or dinner in partnership with a restaurant owner. Coffee break (coffee, tea, fruit juices, soda, baker basketful). Its Continental breakfast served in your room. A 1925 style bar with its famous red wines, cocktails..
High speed internet wireless access (WI-FI network) in all rooms and at the Louis XV lounge.